Each day a baby is born, we feel hope, we sense their potential. Over the past year we were reminded of both the importance of promoting healthy child development and the challenges that lay ahead as we move from a scattering of single programmes to scaling quality supports for young children and families around the world. 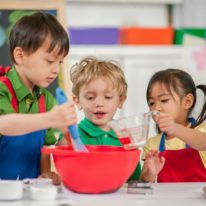 As the Lancet Early Childhood Development Series (2016) reminded us at the close of last year, ‘Young children’s healthy development depends on nurturing care – care which ensures health, nutrition, responsive caregiving, safety and security, and early learning.’ These aspects of nurturance are indivisible, like the domains of development that they represent; hence the need for integrated services that start as early as possible and span the life course. The call for scaling such supports was underscored by the staggering facts also reported in the Lancet Series: an estimated 250 million children under 5 in low- and middle-income countries are at risk of not meeting their developmental potential. The cost of inaction is too high, making immediate action a clear and urgent priority. The good news is that we are seeing promising signs of movement towards scaling to support nurturing care. By scaling we mean expanding and improving services to a greater number of children and families, within a community or across communities. The movement towards scale includes important precursors to change: more vocal and visible champions, growing evidence of effective services, ongoing dialogue about implementation issues. While the political will to invest is still nascent, the awareness of the importance of the early years to long-term health, behaviour and learning continues to grow. Moving to scale does not just happen; it takes strong and decisive leadership. We are particularly honoured to launch the 2017 issue of Early Childhood Matters with the voices of two great champions for early childhood development: Michele Bachelet Jeria, President of Chile, and Dr Jim Yong Kim, President of the World Bank Group. President Bachelet has been a longstanding champion for the rights of children. 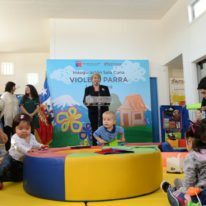 Her efforts to launch ‘Chile Crece Contigo’ a decade ago has served as a model for scaling integrated services for young children and families around the world. Dr Jim Kim’s clear and powerful message – that investing in the early years is important to both child development and a nation’s economic growth – is a critically important statement from an influential leader. His willingness to take this message to policymakers around the world has the potential to bring about revolutionary change and improvements in the well-being of young children and families, particularly for those most vulnerable. We celebrate the leadership of these two important champions for children. The field of early childhood is still evolving. While we are getting closer to understanding the importance of providing continuous quality services across the early years, to be effective we need to continue to innovate, learn and adapt. This need to look for new ideas and to evolve as a field is true for every aspect of the work to improve the lives of young children; from the need to continue to explore new aspects of the science of child development, to efforts to build public awareness, to the search for effective service delivery strategies. In this section of the journal we present seven innovations, starting with the work of Dr Patricia Kuhl, whose groundbreaking work has contributed to the explosion of information on early brain development. From her research lab in Seattle, she documents the importance of early social interactions to learning and overall development. Recognising the importance of bringing brain science to a wider audience, Karen Brown tells us about the recent launch of the Global Journalism Institute on Early Childhood and the Developing Brain, an exciting effort organised by the Dart Center for Journalism and Trauma at Columbia University. The Institute brought together a group of journalists from around the world to better understand the science of early childhood as well as the implications. It is this combination of scientific inquiry and communication that is helping to fuel the interest in the early years of life. Continuing the theme of innovation, we turn to the bold and creative efforts of Sesame Workshop and the International Rescue Committee to encourage and support nurturing care for the children and families affected by the conflict in Syria. Nada Elattar and Katie Murphy share the ongoing work and innovative plans to use a multimedia approach to addressing the needs of children in crisis. This effort has the potential of not only reaching children and families suffering from the immediate conflicts around the world, but also to shine a spotlight on the overall needs of young children and families during emergencies and to expand the concept of humanitarian assistance to include stepped-up efforts to support families with young children. Moving from the media back to the national and local levels, we highlight three emerging efforts including an innovative partnership to reach the private sector, a study of the ecosystem in communities and the effects it has on young children, and a new effort to support vulnerable pregnant women. While these three articles are very different, all three contribute to knowledge development and the search for new and innovative ways to serve young children and families and build ongoing support. Carmen Lica provides us with a reflection on the important work being done to reach out to the business community in Romania. Professor Sharon Goldfeld and Dr Karen Villanueva from Melbourne, Australia, highlight the Kids in Communities Study, taking an ecological approach, and setting forth a clear conceptual framework for exploring the ‘community domains’ that may impact on early development. The results of this study have the potential to provide important insight into the impact of community on child development. Staying with the local theme, we turn to the article by de Graaf, de Groot, van der Hulst, Bertens and Steegers which provides a snapshot of Mothers of Rotterdam, an emerging initiative to create new medical and social support programmes for vulnerable pregnant women, an area of early childhood too often ignored. Finally, we conclude the section on breakthrough ideas with Rachel Machefsky’s important article on the trends in leadership development in the field of early childhood. This article is based on interviews and information from four leadership programmes including two well-established efforts as well as two new and exciting initiatives. Together these innovations are helping to build the capacity of the field and create a new cohort of leaders so important to our ability to move forward on behalf of young children. "We are at an important turning point in the journey to assure that all children are successful early in life. The momentum is with us." While all of these efforts address various aspects of growth, this final section of the journal focuses on three concrete examples of scaling up and six articles highlighting implementation issues: assuring quality, financing, monitoring and measurement. We conclude with an update on the emerging global early childhood network which holds much promise for accelerating progress towards scale. This section starts with the specific examples of scaling which provide a snapshot of work going on around the world across the early years. In their article, Nathaniel Foote and Giorgio Tamburlini focus on Kangaroo Mother Care, an evidence-based intervention for improving the health and survival chances of premature and low-birthweight infants. They share important lessons learned over the years regarding implementation and strategies for the future. We then turn to two countries, Niger and Bangladesh, and their efforts to scale services. Oumar Barry, Ali Mory Maïdoka and Patrick Premand share the important initiative launched in Niger to bundle behaviour change efforts, supporting parenting practices conducive to early child development, with income supports. Rounding out this trio of examples, Zannatun Zahar and Khosneara Khondker chronicle the efforts in Bangladesh to expand pre-primary services. There is a growing awareness that the success of scaling depends on some assurance that key elements of supportive infrastructure are in place. 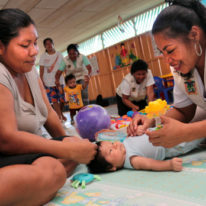 Two articles address quality issues: Maria Caridad Araujo discusses the rapid expansion of childcare in the Latin America region and sets forth a series of important recommendations to promote quality at scale. Moving to the South and South East Asia Region, Sandipan Paul outlines efforts in India, Singapore and the Philippines to establish programme standards. Since the issue of financing is key to expansion and quality, we turn to two articles focused on bringing new resources into the system. Martin Short and Mavis Owusu-Gyamfi highlight the innovative financing model The Power of Nutrition, while Arjun Upadhyay and Vidya Putcha focus on improving policies to better finance services for young children. From early nutrition to early learning, it is clear that one of the greatest challenges is to secure substantial new resources to scale nurturing care. A key part of making the case for early childhood provision is the importance of monitoring child development and creating coordinated data systems. Professor lgi Öztürk Ertem shares a critical view and an important tool for monitoring and supporting individualised child development. At the same time, Abbie Raikes and Ivelina Borisova provide important insight into the need for population-level data, and present experiences from countries around the world. 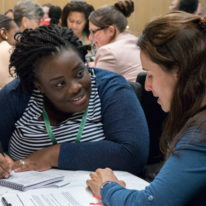 We conclude this series of articles with an important update by Lucy Bassett and Ana Nieto on the emerging Early Childhood Development Action Network. This critical new partnership aims to strengthen support for young children and accelerate change around the world. Basset and Nieto outline the rationale for such a network and how it will engage with countries around the world. During this formative period in the network’s evolution, we remain hopeful that it will fulfill its potential and become a strong force for change. Throughout this issue of Early Childhood Matters, we hope you will be encouraged by the variety of activities going on around the world in support of young children and families – from innovation to scaling, from research to service delivery, from capacity building to cooperation. We are at an important turning point in the journey to assure that all children are successful early in life. The momentum is with us. We hope the examples in this issue inspire, celebrate each step taken, and help us move forward to address the challenges ahead. "The movement towards scale includes important precursors to change: more vocal and visible champions, growing evidence of effective services, ongoing dialogue about implementation issues."